It’s a debate that has been raging for decades. Clearly, in terms of global greenhouse gas emissions, a single person’s contribution is basically irrelevant (much like a single vote in an election). But my research, first in my masters and now as part of my PhD, has found that doing something bold like giving up flying can have a wider knock-on effect by influencing others and shifting what’s viewed as “normal”. In a survey I conducted, half of the respondents who knew someone who has given up flying because of climate change said they fly less because of this example. That alone seemed pretty impressive to me. Furthermore, around three quarters said it had changed their attitudes towards flying and climate change in some way. These effects were increased if a high-profile person had given up flying, such as an academic or someone in the public eye. In this case, around two thirds said they fly less because of this person, and only 7% said it has not affected their attitudes. To explore people’s reasoning, I interviewed some of those who had been influenced by a “non-flyer”. They explained that the bold and unusual position to give up flying had: conveyed the seriousness of climate change and flying’s contribution to it; crystallised the link between values and actions; and even reduced feelings of isolation that flying less was a valid and sensible response to climate change. They said that “commitment” and “expertise” were the most influential qualities of the person who had stopped flying. It’s not all a bed of roses, of course. Flying represents freedom, fun and progress. It boosts the economy and can provide precious travel opportunities. So suggesting that everyone should fly less, which may seem the implicit message of someone who gives up flying because of climate change, can lead to arguments and confrontation. One person for example said that my gently worded survey was “fascist and misinformed”. You don’t get that when you ask about washing-up liquid. My research also probed ideas of inconsistency and hypocrisy. In short, people hate it. If Barack Obama takes a private jet and has a 14-vehicle entourage to get to a climate change conference, or a celebrity weeps for the climate while rocking a huge carbon footprint, it doesn’t go down well. And if future laws are introduced to reduce flying because of climate change, it looks essential that politicians will have to visibly reduce their flying habits, too. Other research has shown that calls for emissions reductions from climate scientists are much more credible if they themselves walk the talk. That people are influenced by others is hardly a shocking result. Psychology researchers have spent decades amassing evidence about the powerful effects of social influence, while cultural evolution theory suggests we may have evolved to follow the example of those in prestigious positions because it helped us survive. Pick up any book on leadership in an airport shopping mall and it will likely trumpet the importance of leading by example. Weaving an invisible thread through all of the above is the thorny issue of fairness and inequality. 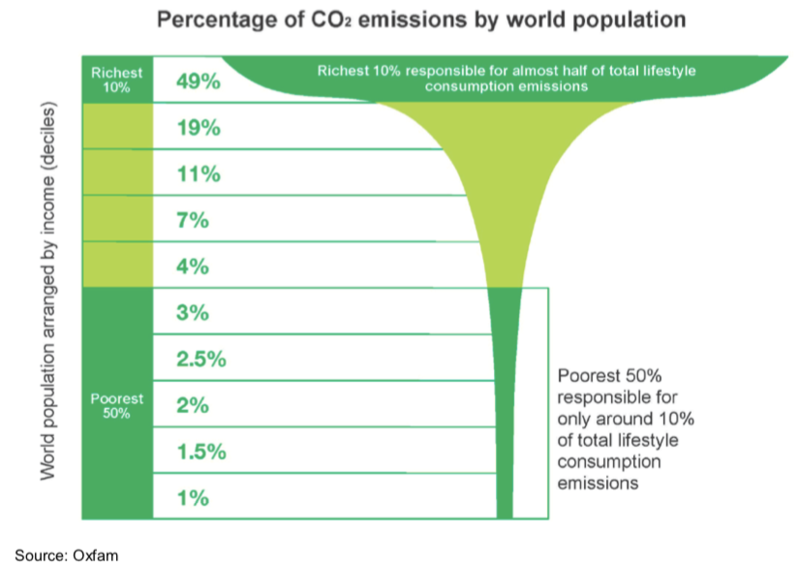 The wealthiest 10% of the global population are responsible for 50% of emissions, and plenty of that will be due to flying. As emissions from aviation become an ever increasing slice of the total (currently around 2% globally) this inequality will become harder for everyone to ignore.